The Walking Dead&apos;s sixth season has returned and its first two episodes have had fans raving about its season premiere deathfest and a romantic surprise (We ship it!) in episode two. AMC hopes to bank on the excitement after the season&apos;s end when companion series Fear the Walking Dead returns, as evidenced by its April 10 premiere date. 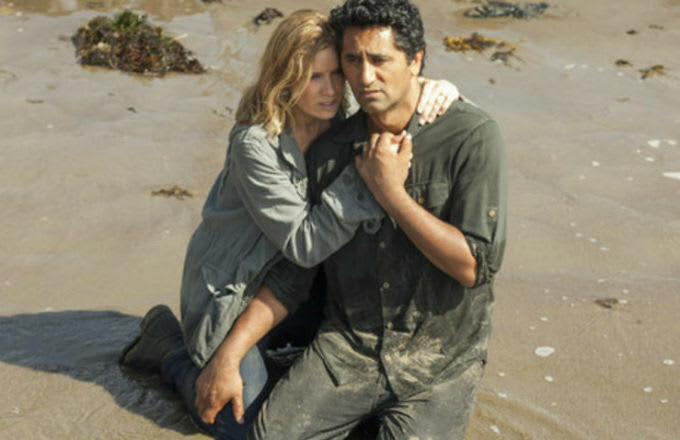 FTWD already got mind-blowing ratings for its first season, landing the title of the highest-rated first season in cable history so the pressure is on to avoid the sophomore slump. A new teaser trailer for season two shows maybe audiences shouldn&apos;t fear a slump. Set in Los Angeles, Fear the Walking Dead premiered last summer so in the event people were out having a life and not watching we&apos;ll skip spoilers. The action-packed teaser trailer titled "No Safe Harbor" and provided exclusively to IGN shows the group on a beach fighting against walkers, and even some gun-toting humans! Over the teaser Madison, one of the main characters, says, "To kill the monster, you become the monster." Fans of TWD will be reminded of one of Rick&apos;s epic speeches in the series when he tells the group: "That&apos;s the trick of it, I think. We do what we need to do, and then we get to live…This is how we survive: We tell ourselves that we are the walking dead." Fear the Walking Dead&apos;s 15-episode season will be split in half like TWD with the rest of the episodes airing later. TWD season six finale (said to have been shot twice because of foul-mouthed Negan) will reportedly be sickening according to Andrew Lincoln, so maybe viewers won&apos;t be able to bear to watch more despair in FTWD afterwards.